A riveting and illuminating tour of how nations deal with crises-which might hopefully help humanity as a whole deal with our present global crisis. Jared Diamond does it again: another rich, original, and fascinating chapter in the human saga-with vital lessons for our difficult times. 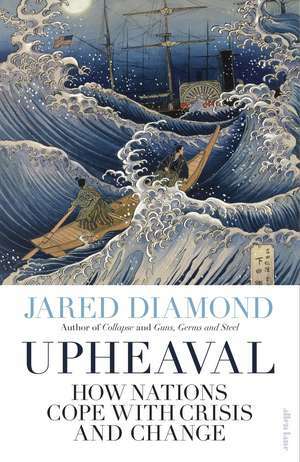 Upheaval is a brilliant, gripping, personal account of nations in crisis, informed by how people respond to crisis. It's an especially timely read today, when nations are stressed and have much to learn about how to survive big challenges. I urge you to read it. In Upheaval, I find eye-opening lessons about the political and psychological forces that lead to crisis and then resilience, how individuals and nations experience trauma in similar ways, and what that suggests about our future and the world's . . . wise and beautiful. Jared Diamond is one of the deepest thinkers and most authoritative writers of our time-arguably of all time-and Upheaval proves his prescience in analyzing historical crises within nations at a time when national crises have erupted around the world . . . No scientist has ever won the Nobel Prize for literature. Jared Diamond should be the first.